Note: You can enter this giveaway one (1) time per e-mail address per day. Deadline is 11:59PM ET 5.25.17. How do you show someone you care? You could send a card but a homemade cake, pie, or fresh-from-the-oven cookies lets your friends and family know they’re especially special. 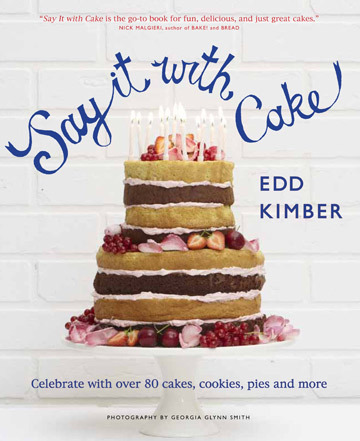 British Bake-Off winner Edd Kimber shares a collection of impressive yet simple-to-make recipes for cakes, pies, cookies, buns, tarts, and more in Say It With Cake. Kids of all ages are sure to love Lemon Love Heart Cookies and Easter Nest Cupcakes, while Raspberry Ripple Choux Buns and Salted Caramel Truffles will make mouths water. Our Fancy Schmancy Cake Recipes slideshow has a few other showstoppers that will delight sweet teeth everywhere. NO PURCHASE NECESSARY TO ENTER OR WIN. Void where prohibited by law. Open to legal residents of the 50 U.S., D.C. and Canada (excluding Quebec) who are at least eighteen years old at the time of entry and have internet access. Begins on 5.4.17 at 12:00:00 a.m. ET and ends on 5.25.17 at 11:59:59 p.m. ET. To enter this giveaway, submit your full name and email address on this form. Odds of winning this giveaway depend on the total number of eligible entries received. Only one (1) entry per email address per day. Sponsored by Leite’s Culinaria, Inc. For more information, visit our Official Rules. For a list of winners, check out our Very Happy Winners page. Be sure to add giveaways@leitesculinaria.com to ensure notification if you are the winner.